At ShopBot, we have been designing and building affordable CNC tools for almost 25 years. ShopBots were the first affordable CNC routers for small manufacturing. Our design choices have been based on our experience manufacturing and using low-cost robotic equipment that is optimized for small and medium production operations. Our leadership and innovation in mechanical components and software has been a key to making CNC technology as widely accessible to all shops as it is today. The importance of mechanical rigidity – A CNC tool does subtractive work. It is a piece of digital manufacturing equipment whose primary feature is shaping components by using a spinning cutter to aggressively remove material – good cutting force and resistance to deflection during cutting is required, as is a smooth and vibration-free motion during the machining process. While pure bulk can be helpful to machining, a CNC tool does not need to be expensive or heavy and immovable to produce fast, smooth cuts and be a great producer. The importance of control system software – You hear a lot about “smart” when it comes to technology these days, but “smart” means more than just running your CNC tool with a computer. Smart tools take advantage of progress in microcontrollers and programming to enhance the cutting and machining performance of a tool, to move it with intelligence, to monitor its condition, to communicate with operators, and to help make the production process friendlier and more interactive. Smart tools can now interact with humans in increasingly helpful ways. They are versatile, configurable, and programmable, making them adaptable to your workflow and production process. This is what we mean by smart. Full-size gantry ShopBots are set-up on-site. You position them where they best fit your shop’s needs and production flow. This versatility means they can be put in areas that have limited access to heavy equipment, in a basement or above the ground floor. The set-up of our full-size tools involves two steps: 1) assembling the steel and aluminum table; and, 2) placing the gantry on the table. The gantry is shipped fully assembled from our factory. The motors on the Y and Z axes have been mounted, and all wiring and hardware installed. The table goes together in a few hours. After the table is assembled, the gantry, which has been fully configured and adjusted at the factory, is simply placed in position on the rails (with a “team lift”). Note that for a gantry-style CNC tool, the gantry essentially is the tool because almost all the components ride with the gantry. That means that after you put the gantry in place, attach the x-motors, cables, and control box, your tool is complete and ready for action. Shipping large tools as components is a more manageable and safer method than dealing with a large, bulky, and vulnerable single structure. Going through the set-up process creates an opportunity to develop a good understanding of the machine as you ready it for work. Optionally, if your operation needs to hit the ground running, we can send a technician to your site to set-up the tool and then train your team. Note: Our smaller tools, the ShopBot Buddy® CNC, which is a mid-size tool, and the ShopBot Desktop CNCs are all shipped fully assembled, ready to be powered-up and put right to work. The stiffness of the ShopBot gantry table comes from its engineering not from weight. ShopBots are assembled with airframe-style bolt-matrixes for strength. Heaviness in a machine-tool can certainly help reduce vibration, but we make full use of materials, such as extruded aluminum profiles, that naturally dampen vibration. You’ll always find YouTube experts who still believe that heavy, cast, or welded frames are important for machining, but heaviness can be overrated and too often simply compensates for other inadequacies of a machine. The practical problem with “heavy” is that it makes a tool less agile, more limited in the locations in which it can be positioned or moved, more power hungry, more expensive to repair, and less friendly for small shops. Such machines (sometimes referred to as “monuments”) do not fit well with a lean production focus which emphasizes a flexibility based on being able to readily reconfigure production flow and processes for competitiveness. Significantly, a bolted table can also be realigned using standard mechanic’s tools after the inevitable shop accidents. We avoid welded joints that can become distorted with time and are difficult to re-square or realign. Sure, truly massive welded or cast tools can be impressive and do have the advantage of bulk, but few low-end, welded, CNC tables are built with the mass, weldment thoroughness, and the attention to alignment required for stability in a factory environment. Be careful not to end up with a tool that is just heavy enough to make it difficult to fit into your production flow and not quite massive enough to prevent it from falling out of alignment. The most identifiable features of a ShopBot gantry tool are its raised table sides. Beginning with the patented architecture of our original ShopBots, our full-size gantry tools have minimized cutter chatter and improved cut quality by reducing the pedestal height of the gantry. This effect is a matter of physics. 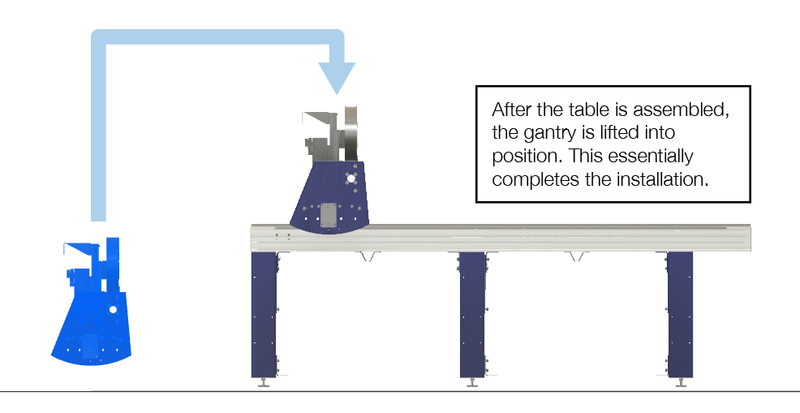 The taller a gantry pedestal – that is the further the distance from the table rails up to the pivot point on the beam for the Z arm – the greater the instability of the gantry. Of course, we want clearance above the work, but rather than just make the gantry taller, our design solution has been to raise the base for the gantry rails using rigid table sides. This significantly reduces the pendulum “moment,” improves cutting smoothness, and allows faster acceleration and deceleration. Raised table sides have the second advantage of helping contain the material being machined. This provides operators and observers an extra safety shield of protection from cut material and flying debris (e.g. broken cutters) that might break loose during cutting and machining operations if not contained by the dust collector/guard around the cutter. Our tall table sides/guards mean that our standard large tools are most conveniently end-loaded (front or back) and are well-suited to natural panel flow through most shops. A suggestion: If you expect that you will be primarily side-loading large sheets, whatever brand CNC you purchase, you may want to consider an extended bed so that the gantry can be parked beyond the length of the material to permit easy side-loading without the obstruction of a gantry in the work area. We engineered the main beam on our gantry tools especially for our CNC tools. Our beams are thickly webbed aluminum extrusions with a strengthening and vibration-absorbing cross-section. They are available for tools having up to a 9 ft. wide cutting area. A mounting face for the linear rails is thickened in the extrusion and then precisely machined and fitted with rails and bearings. 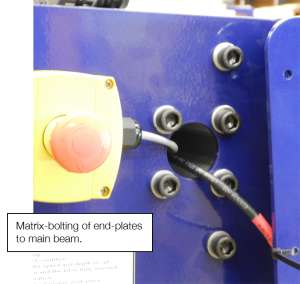 As with other elements of our table, this beam is designed to be matrix-bolted to the gantry’s steel end-plates. The beam carries the steel Y-axis car on which the vertical Z-axis, fitted with a router or spindle, is mounted. 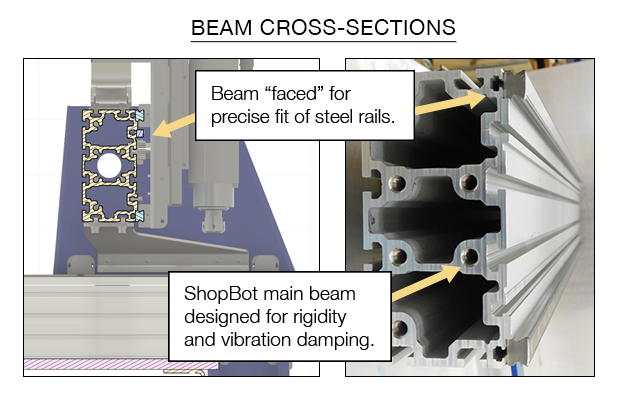 Each axis moves on a heavy-duty linear rail and bearing system. A sturdy beam is the heart of CNC routers and it is where smooth, precise cutting begins. We utilize rack-and-pinion mechanical drive on gantry-tools and screw-drive on desktop tools. We’ve had a lot of experience with various types of motion components for CNC tools and fit the best solution for the needs and purposes of each type of tool we produce. Our desktop uses Teflon-coated, precision lead-screws with anti-backlash nuts. The screws are integral to the motors which virtually eliminates all backlash. On the desktops, the lower screw and rails are fully covered and protected from dust and debris. This integral screw-drive provides a very high resolution for our desktop machines. For larger tools, we have found that rack-and-pinion provides the most straightforward and reliable drive system. Rack-and-pinion is highly impervious to the dust and debris of a shop and does not require precise alignment to prevent binding. The modern geometry for grinding rack-and-pinion gearing insures smooth action with limited friction and low backlash. Components can be easily replaced if they become worn. We rarely see significant wear on the rack, but pinions do wear, so you can expect to replace them every year or two during normal use. The debate over the motion mechanism for CNC routers – rack-and-pinion drive vs. screw drive – can get hot and heavy. We think both systems are pretty good, and over the years we’ve built tools employing each. In theory, ball screws offer the advantage of being virtually friction-free and very smooth. However, they are also more complex. They require a constant precise alignment to avoid binding and are very vulnerable to being disabled by dust and debris, so they must be kept very clean. As the length of an axis gets longer, increasing stiffness in the ball screw is required to prevent the screw from wobbling. This results in large, heavy, and expensive screws (which, in turn, require larger motors just to get them up to speed) that must be well-protected from dust. Perhaps one factor to keep in mind with respect to CNC mechanicals is that these industrial components have been used as motion components of machine tools and automation equipment for the last 150 years – they are not, recently-evolved mechanisms that are unique to CNC. Over those 150 years, the quality and performance of each type of mechanical drive has been perfected. Gearing design and manufacturing have become highly refined as have the various screw-drive mechanisms for producing smooth motion. Look at a few $100,000 and up CNC tools. In these tools the drive mechanism is only a small part of the overall cost, so the drive decisions have been made primarily with respect to performance. You’ll note that in these tools both types of drive system are used. Sometimes in the same tools screw drives are used for one axis and rack-and-pinion for another. The bottom line is that either mechanism can produce good performance. We have recently completed an experimental analysis and tests of drive mechanisms that specifically included assessment of helical gearing, a refinement of standard rack-and-pinion. We also evaluated the importance of the gearhead or belt-linkage between motor and pinion. Helical gearing represents a conceptual improvement over straight rack as it produces a more continuous engagement of gear teeth and, in theory, less backlash. 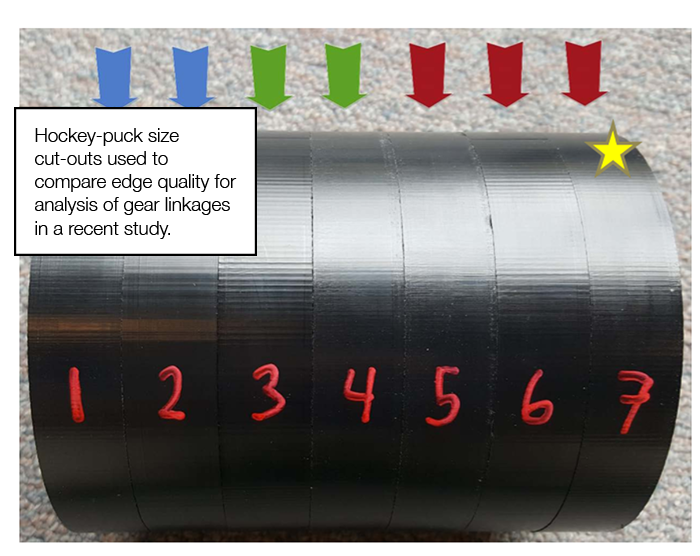 We were optimistic about the potential for helical gears, but in our testing, we found that helical gearing added little improvement to cut quality, particularly in comparison to other factors. Our tests actually identified backlash in the linkage between motor and effector (that is, between motor and pinion for rack-and-pinion drives; between motor and ball-screw in a ball screw system) to be the primary source of backlash and the primary determinant of cut quality. For us, this emphasized that the focus for smooth cutting should be the reduction of backlash in the gearing of the motor linkage rather than the specific type of rack-and-pinion. 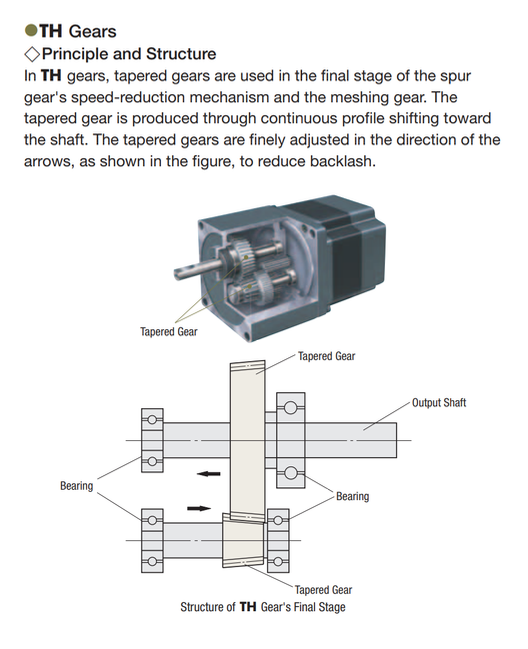 For gantry ShopBot tools, we improve the standard spur gear linkage between motor and effector by using tapered-hob gearheads on all tools (see image below). These gearheads put the emphasis on reducing the backlash that directly results in smoother cutting. The cutting motion of ShopBots is powered by stepper motors. Steppers are an incredibly precise form of motor that have the unique feature of never producing incremental errors. A stepper is just as accurate at 80″ as it is at 8” because the rotary position of the motor shaft is just as accurate after dozens of turns as it is after one turn. Stepper motors are inherently digital and thus they are a perfect match to digital computers, digital control, and digital cutting. Conventional open-loop stepper motors such as those employed on our PRSstandard tools and our Desktop tools are the most affordable solution to producing CNC motion. The counterintuitive feature of stepper motors is that the faster they go, the less power they have. This means that they have the limitation that they can be overpowered if one attempts to cut too fast – losing track of location in the process. However, when used appropriately, these motors will produce excellent cuts, day-in, day-out as they do in a wide range of devices from printers, to CNC mills, to medical equipment. For heavy-duty, production work we recommend our PRSalpha tools. These tools use closed-loop stepper motors and high-performance hybrid drives. These closed-loop motors have sensors (called encoders or resolvers) that continuously monitor performance and the precise location of the motor shaft. When forces on these motors increase, or if the shaft is pushed slightly from intended position, the motors instantly increase force and recover to the correct position. Servo motors also have built-in feedback and are commonly used in CNC tools. They can be a good solution for CNC, but we favor the closed-loop alpha-step motors because of the hybrid technology combining crisp digital control in stepper mode for small moves while responding with servo-like dynamics when higher power, speeds, or position compensation are required. Undersized servo motors may not provide the speed, power, or acceleration you expect. 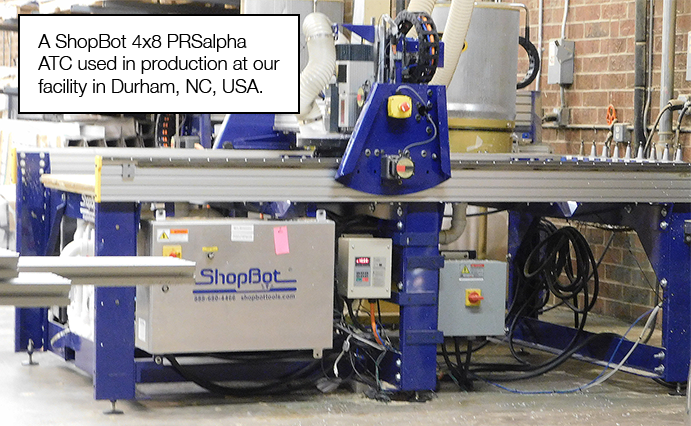 Our PRSalpha CNC routers can travel at 1800ipm and have 150-250 pounds of cutting force. On our gantry tools, we have exclusively used motors built by the Japanese manufacturer Oriental Motor (OM). OM is an international company that has been building high-quality motors for more than a hundred years. Their industry-leading technology has been much imitated, it’s easy to find budget motors that have been made to look like OM products. The copies often fail to live up to the OM performance, which depends on extremely high-grade bearings, precisely cut armatures, dense magnets and carefully wound coils. ShopBot has used OM motors on our gantry tools for over 20 years, shipping almost 40,000 of them. During this period, we’ve had fewer than 6 failures, which means these motors can be counted on for day-in, day-out production – absolutely. When you are considering the bulk and power features of a tool, do watch out for the macho-power and capital-cost game; it is easy to get ratcheted-up into a large capital layout trap in the form of a leased tool that you need to constantly feed with work, just to make those lease payments. As one of our customers recently noted: “You have to wonder about a tool when they start quoting you an hourly lease cost.” The new industrial revolution is about technologically empowering tools that are becoming available to all sizes and nature of production facilities with prices that are going down – this trend of decreasing tool price has been expressed as a “democratizing of the tools of production.” While new technology tools will cost something, they are becoming increasingly accessible to all shops. Make sure you can afford your new tool. We are continuously evolving the capabilities and functionality of our tools. We occasionally introduce new models, but our policy is to, as much as possible, evolve our tools as opportunities arise with small iterative improvements that we can introduce immediately and make available to older tools. For example, we currently offer new versions of our Z-axis that is backwards compatible for tools up to 16 years old. Also, as we create new accessories for tools, we focus on making them usable on all tools. This is the advantage of building the equipment ourselves and not to be dependent on changing shipping parts from overseas, or on a gallery of changing designs that depend on what vendor is offering the best export deal. We work to avoid putting you in an obsolescence loop – we always have parts for older tools, and we frequently have upgrade parts that will improve performance. In the 1990’s, the first ShopBots took advantage of the emerging personal computer (PC). PC’s allowed us to make CNC technology more accessible and affordable. Our early tools made use of the new devices to control the tools, rather than relying on expensive, electronic motion boards for control. This means that from our origins, we have integrated the creation and development of control system electronics and control software with the mechanical aspects of CNC tools. We appreciate that good tools start with good mechanicals, but over the years of producing and using CNC tools we have come to a strong belief that software control systems are equally important. In the beginning, software was a focus for us in helping get the costs of equipment down, but as our products developed, our focus shifted to control system software and that provides both smooth efficient cutting and ease-of-use in production. This means that the hardware and software systems that run our tools are tightly integrated with our tools because they were designed for the tools. Our recognition of the importance of software distinguishes us as the only manufacturer of affordable CNC tools that produces its own controls and software. Our software provides smooth cutting motion and crisp acceleration. We have focused on getting high-resolution, straight line and complex curved motion that is chatter-free with crisp accelerations and decelerations to make cutting efficient. ShopBot’s feed rates, speeds, and accelerations are fully adjustable in the tool’s software interface and from within toolpath files. ShopBot’s software interface is straightforward and intuitive to use. Carrying out basic tasks and house-keeping functions such as homing is intuitive. The control software runs toolpath files (part files) generated from virtually any CAD/CAM program. It can utilize files in standard g-code format (Fanuc/NIST RS274) and well as toolpath files that have been created in OpenSBP, an open-syntax CNC language (supported by most current CAD/CAM software). OpenSBP is a “conversational” and programmable language developed by ShopBot and contributed to the public domain. Thus, you are able to run ShopBots with two different types of CNC files. Traditional g-code is fine for just running files output by CAD/CAM programs. It may feel particularly friendly if you are a CNC operator experienced with other tools, but g-code is an old format that was optimized to be read from early paper tape input devices. It’s awkwardness and illegibility are no longer necessary for digital efficiency. ShopBot’s OpenSBP option provides a second and more ‘conversational’ language that is easy for a human to read, understand, and use. Unlike g-code, OpenSBP includes built-in programming functions (such as variables, logic testing, and looping) that make it readily programmed using friendly, BASIC-language-like expressions. OpenSBP makes it straightforward to do everything from creating a button for moving a tool to a position you frequently want it to go, to creating special production routines that will improve the efficiency of workers as they manage jobs and files and move parts through your production process. Programmability and configurability make ShopBots easy to set up for even highly specialized jobs, and they can be readily reconfigured for the next job, a day or a month later. Truly interactive digital tools with interfaces that are congenial to production line functionality and automation are what makes a tool helpful and efficient beyond just getting a part cut. It’s what makes a tool ‘smart.’ Don’t assume that because an imported tool calls itself smart, it has any of this flexible configurability or programmability. As with hardware, we continuously evolve our control systems and software as opportunities to add capabilities and features as they become available. The most recent software for your tool is always available for download from our website, FREE. When the availability of new electronics allows us to develop improved controllers, we also make them available for older ShopBots. It is possible to retrofit our latest control cards or control box – greatly improving the functionality of a tool – to virtually any age ShopBot. Coming Soon: Our new FabMo software (short for FABrication and MOtion control platform; currently available on Desktop Tools and Handibots) is our next generation digital fabrication software. FabMo software make use of advanced “S” shaped curvilinear profiles for accelerations and decelerations. These profiles provide smoother action than the trapezoid-shaped, linear acceleration profiles found on most CNC tools. Our profiles are optimized to reduce “jerk” (jerk is a technical term for the 3rd derivative of speed; it is a measurable type of disruption of motion). Jerks cause bumps in cut edges. When they are not managed carefully, they limit how fast a tool can work and contribute to chatter in cutting. ShopBot’s profiles are specifically oriented to reduction of jerk for given acceleration rates and feed speeds. This means our tools work faster, more efficiently, and with smoother cutting – all without adding weight or cost. FabMo software includes an improved environment for creating custom production solutions and for new ways to monitor and interact with tools. FabMo software will be unique to ShopBots as we make it available on all our tools in the coming year. For almost 25 years, ShopBot has been developing and manufacturing CNC tools for use in small manufacturing and by individuals. We believe that digital fabrication is the key to making small manufacturing in our communities competitive again. We believe that digital manufacturing is how we can again do competitive, realistic and fulfilling production. We pioneered affordable CNC. It’s no surprise that we have more competitors today than 25 years ago, when we were the only manufacturer providing digitally-controlled routers appropriate for the needs of small manufacturing. We are frequently asked how we feel about companies that have recently adopted our approach and are now offering affordable technology tools. Well, actually … we feel good. Of course, we’re flattered, but there is more because we believe that digital fabrication is the single most important key to returning manufacturing. Increasing the availability of affordable CNC technology will help promote local manufacturing and bring more work for all of us. Additionally, some of our competitors offer mechanical approaches not available from us – tools that differ because of design choices with respect to one or another of the options described here. As we note, many of the options are equally good, or offer different sets of trade-offs that may be right for some shops. We won’t hold it against you if you choose another tool. What we want to do is encourage you to continue to use the amazing resources of our website, our free interactive web training, and our user forums. There is a tremendous amount of how-to information of general CNC interest available to you from our site. And you can always give us a call to talk over any question you may have about CNC.